Lacy Bookmark becomes felted bracelet/choker... pix to follow. i really liked the colour and feel of the felted sample i made up so i did this little number as a warm-down from my all-night glove session. slightly adapted, i shortened the joining chains from 8 st to 4 to make it narrower. 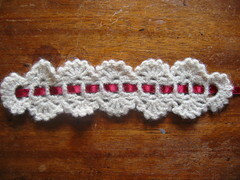 it was going to be a bracelet but then i realised i didn't have enough rows for the pattern to work out properly so i added more and it ended up too long. i should have been thinking about the ribbon weaving too, as i ended up with an even number of posts, rather then the odd number i needed but it's not that noticeable. it felted perfectly and feels scrummy, looks quite cute too if you can get past how badly my table needs polishing.